I actually had occasion to really put the Lumintop TD16 through its paces the first day beyond a deliberate test on an otherwise ordinary day. Parts of my city lost power due to a hail storm just before sundown right after I’d received the flashlight. Though I have a house full of flashlights, I knew that this flashlight can tail stand. Figured that’d make a great first test, so I set it up in the living room on medium mode (220 lumens). Given that this mode can run up to 6 hours and I had two spare 18650 batteries handy, this provided a pleasant and very usable amount of light. With it set up at the front of my living room I had enough light to read or play cards — two things you might do to pass time in a power outage. 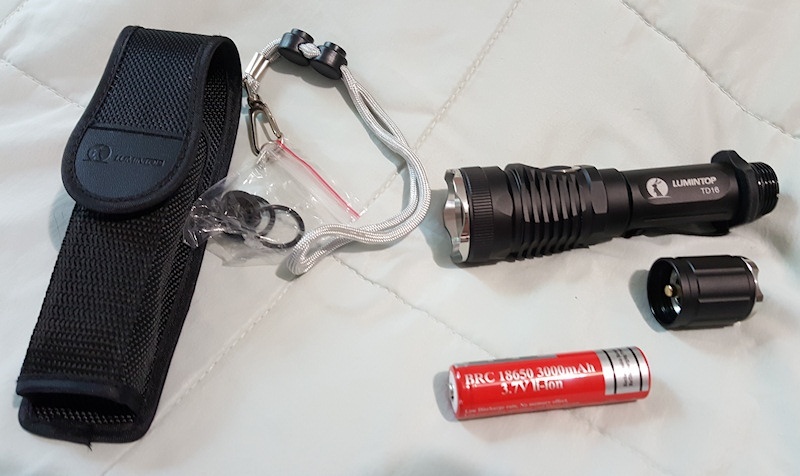 You can check this flashlight and other items out online here — use discount code BLLBrian to get 20% off anything you buy there! 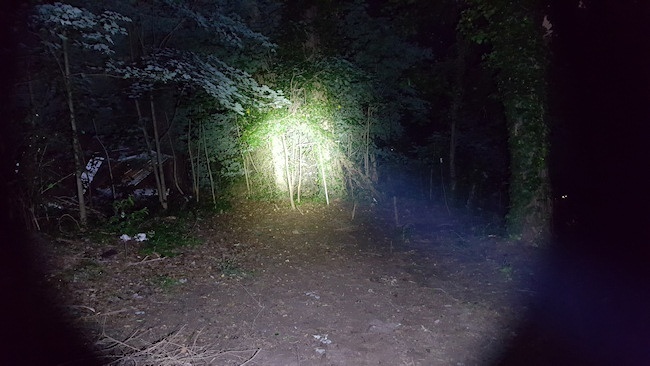 These are photos taken shining the flashlight at a section of trees in my back yard at a distance of roughly 6 meters (18 feet). Taken at a point in the night where you could barely see anything without light. Lumintop TD16 Distance Low mode. Photo by Brian Watkins. Lumintop TD16 Distance Medium mode. Photo by Brian Watkins. Lumintop TD16 Distance High mode. Photo by Brian Watkins. Low mode is what you’d expect on a power-saving setting. It provides a small amount of usable light focused on a narrow region. 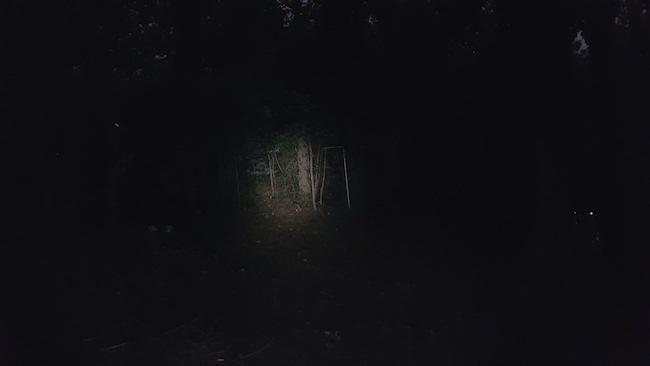 Medium mode would be useful for walking at night, shining a nice amount of focus light and casting off a useful amount of light in a radius around it. 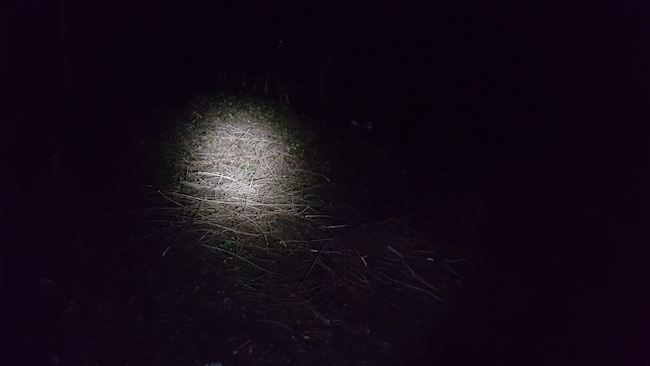 If you’re walking where it’s dark, the radial light is sufficent to notice rocks and sticks so you don’t trip on them, and the 6 hour run time makes it a versatile mode. High mode, as you can see in the photo, creates an incredibly bright hot spot. It’s surrounded by what almost seems like daylight radial light, illuminating a large area at a time. 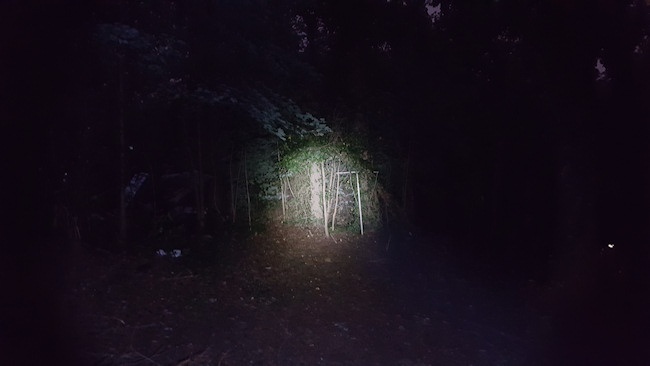 If you want to see big portions of your yard (or wherever you are) in fine detail, the high mode doesn’t disappoint with its 1000 lumens. 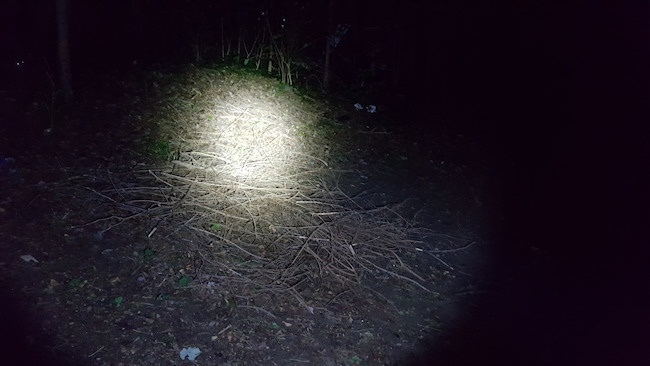 For this series of shots, I shined the TD16 at a pile of sticks on the ground directly in front of me to see the detail up close. This closer distance is where the medium mode really excels. Low mode is usable, but comparatively there’s a great amount of detail using the medium mode without washing the subject out. Radial light is excellent. The high mode is a bit much this close up. 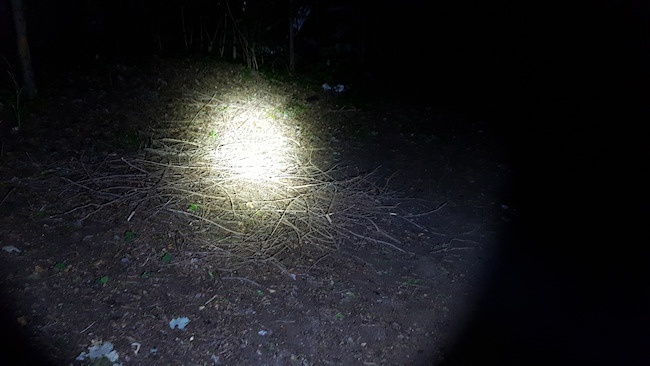 It’s so bright that it washes out what you’re looking at in brilliant white light, and you don’t benefit as much from the radial light this close (as you do at a distance) from the 1000 lumens. This is a well-built flashlight. It’s durable, throws a great beam for a considerable distance (beyond what I showed in the photos), and has a nice wide reflector head. Wider than most of the flashlights I own. The included holster is easy to use would would make the TD16 ideal for hiking, camping, and law enforcement use. For law enforcement, the high mode can light up a parking lot or large interior space well, leaving little room for shadows or obscured details. Really, those 1000 lumens can’t be understated. You switch modes with the easy button near the bezel, while turning the light on and off with the tail cap switch. This makes it easy to adjust brightness levels while holding the light steady. I’d really recommend using 18650 rechargeable lithium ion batteries as I did with this light. It can also accept 2 CR123A lithium batteries, but those are harder to find than your average AA battery, and significantly more expensive to boot. Also, battery tests in various flashlight forums consistently show better battery life using one 18650 than two CR123’s. Check out the Lumintop TD16 and other super bright LED flashlights on Lucky Light Bank’s Amazon store for great deals. You can even save 20% by using the discount code BLLBrian. What comes in the box, excluding the 18650 battery shown. A holster, spare o-rings, a lanyard, and the flashlight. 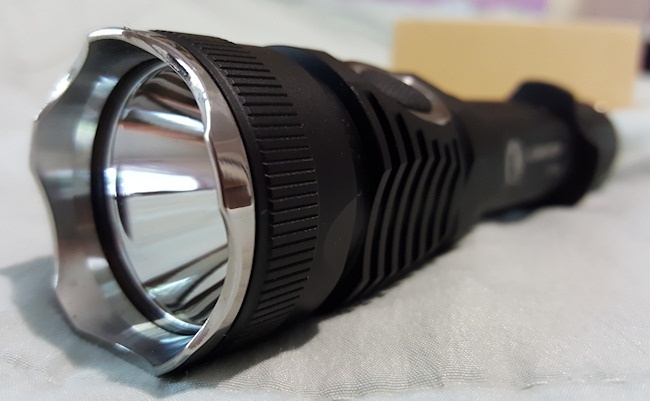 LED torches are great devices for brighter lights in the dark. I prefer to use them for better viewing while riding in the dark. Thanks tough for the good review.